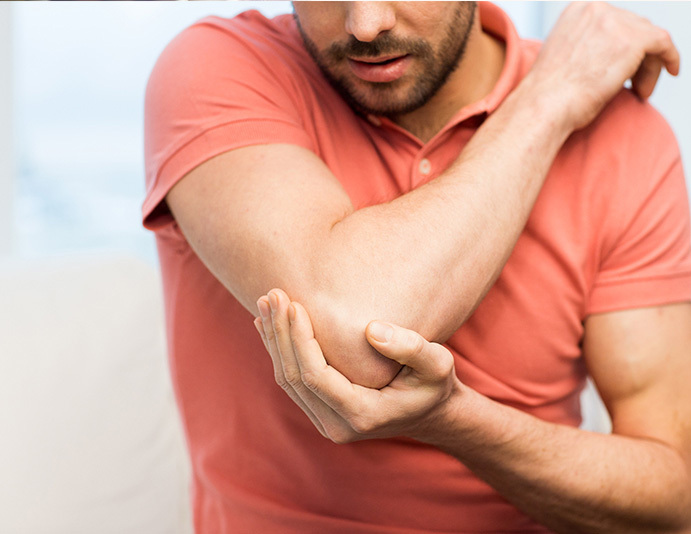 Tennis elbow, which is also called elbow epicondylitis/epicondylosis, is a chronic pain condition that develops in the tendons of the forearm from overuse. Tennis players and golfers are increasingly susceptible to this condition due to the nature of their sports -- both require repetitive swinging motions, which can irritate muscles, ligaments, and nerves in the elbows and wrists. Patients suffering from tennis or golf elbow typically report symptoms such as pain outside of the elbow that radiates toward the forearm and wrists; swelling and tenderness around the elbow joint, and a decreased range of motion. Treatment varies depending on the severity of the condition. The first line of defense for tennis elbow usually includes conservative therapies such as rest, ice, compression, and elevation. If the pain persists, then it may be time to see a specialist at AFC Physical Medicine & Chiropractic Centers. Our team is dedicated to improving a patient's elbow function through physical therapy, massage therapy, trigger point therapy, and more. After the successful completion of our comprehensive treatment programs, patients will be provided prevention tips to avoid this type of pain in the future.